​Margaret’s love of dancing is contagious: she makes you want to abandon all your inhibitions and just take to the dance floor and lose yourself in the rhythms and music of the gypsies of Eastern Europe or the islands of the Pacific! Just take a class with her, and you’ll understand …. She was born in Illinois in 1952, the oldest of six children, but moved to Chapel Hill at the age of four while her father was studying for his Ph.D at UNC. He then worked in the Dental School until his retirement in the ‘90s, and Margaret found out later “that he’d been really famous; he is known today as The Father of Dental Infection Control.” Her mother is a novelist and still teaches writing at the Arts School in Carrboro. Margaret entered high school in Chapel Hill just after they had integrated the public schools, and it was an exciting time. She remembers it being difficult for black students during the first few years, especially after the death of Martin Luther King. Just before her senior year, she was invited by a neighbor to get involved in starting up and finishing her senior year at a new integrated alternative school. The Chapel Hill Independent School opened with 35 students and some ten UNC professors who volunteered their time and encouraged the students to learn by doing rather than learning by the book, and by getting involved in the community. “We were on a shoestring budget, but the education was wonderful,” she says. “I realized that learning could be fun, fascinating and amazing, and that’s what got me interested in education as a career.” The school later closed due to lack of funding, but for Margaret it had served its purpose: it had inspired her to get involved in education. Goddard College in Vermont offered an individualized study program that appealed to her, and after she graduated in 1973 she returned to the Triangle area and taught for several years in Durham public schools before receiving her Master’s degree from Goddard. She later did Ph.D. course work at UNC. Teaching impoverished children in Durham was a challenge and her ideas of how children should learn were not always shared by the school authorities. “The principal decided to show me how to administer corporal punishment, so he gave me a paddle that he expected me to use on the kids. He taught me how you can paddle a student so that it would hurt like crazy but not leave a bruise.” She never used it. She jumped at an offer to teach at Duke University’s pre-school and primary program, even for half her previous salary, as finally a school wanted her to use her expertise in project based learning and to teach in the ways that she felt were best for children. When Duke decided to close the school, Terry Sanford, the President of Duke at the time, arranged for the university to let the new Duke School for Children build on university land. “We had no money at all, but we had parents who were really enthusiastic. It was exciting; I became the Curriculum Director and was involved in hiring, training and supporting teachers.” The Duke School flourished and now has more than 500 students ages three through middle school. Margaret became interested in dance when she was in her teens. 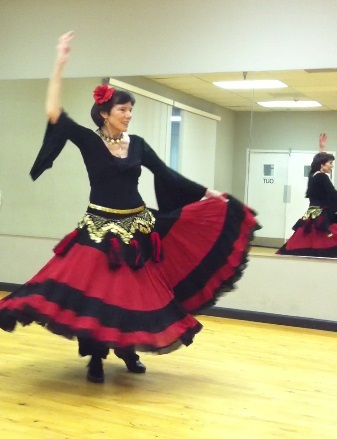 A UNC professor had convinced her to come with him to international folk dancing classes, and she was hooked. She started dancing, performing and teaching European folk dances and performing Mediterranean ‘belly dance’ as her hobby. When she later had to stop teaching full time, she decided to study women’s dances of ethnic groups around the world. “I’m particularly fascinated by how women dance when they just dance for fun, just among themselves.” Women’s dances differ from country to country, but in warmer areas around the world where women dance with their whole bodies, many moves are quite similar. Margaret is currently researching the ways in which Roma (gypsy) dance styles have influenced some Turkish, Egyptian and Spanish dance. Each summer she and her husband Bob, a Professor Emeritus at Duke, set off in their small RV for three months and head for Oregon to visit their grandchildren and camp out in their backyards. They take time on the road to visit national and state parks along the way and to explore away from the beaten track. Both are avid hikers. Margaret also enjoys running the trails and watching the birds in the wetlands park near their Durham home. If she had to choose a different profession, she says, she’d be a naturalist. Bob still teaches occasionally in the graduate program at Duke, and last year taught one of his classes in China at the Duke Kunshan University campus near Shanghai. Come and enjoy, and lose those inhibitions!